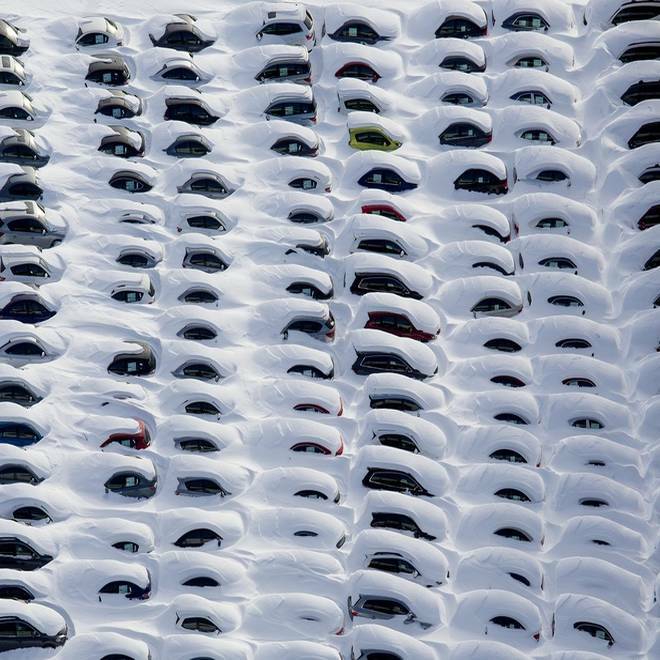 Cars are buried by snow near Hamden, Conn., Sunday, in the aftermath of the winter storm that hammered New England. Updated at 8:42 a.m. ET: The Northeast began stirring back to life Monday after being buried under a record-setting winter storm that left at least 12 people dead, buried cars and effectively closed some of the nation’s busiest airports for large parts of the weekend. Highways that had been clogged with stuck cars reopened, and airports reported few cancellations as crews labored to move more than 3 feet of snow in some areas, restore power to hundreds of thousands of customers and open subways, bus routes and commuter railroads. At least 12 people died in New York and New England, according to The Weather Channel –- five in Connecticut, three each in New York and Massachusetts, and one in Maine. As of 8:40 a.m. ET Monday, airlines were reporting only 114 cancellations in the United States, many of them unrelated to the storm, according to FlightAware.com. That was a stark difference from Friday and Saturday, when thousands of flights were cancelled, mostly involving Boston and New York airports. A dangerous winter storm churned Friday into the Northeast as forecasters warned of a whiteout. Power was being restored at a relatively fast clip, with outages in the Northeast below 150,000 early Monday, The Associated Press reported. About 650,000 customers were without power during parts of the weekend, but states lent help to each other, sending crews where they were most needed. In New York, where the Big Apple had a comparatively minor snowfall but Long Island was hammered by high winds and heavy snow, Gov. Andrew Cuomo sent more than one-third of the state’s snow-removal equipment to hard-hit Suffolk Country. On Sunday more than 675 pieces of snow-removal equipment and 975 people were working to clear roads and open the way for commuters to get back to work Monday, Cuomo said in a statement. “Suffolk County has not seen a winter storm like [this] in years, and the massive amount of snow left behind effectively shut down the entire region,” the governor said. In Massachusetts, Gov. Deval Patrick ordered the reopening of state offices for Monday, just two days after declaring a state of emergency as some communities were buried under more than 3 feet of snow. Boston got two feet of snow, and hurricane-strength wind gusts to the east of the city. Connecticut, which saw the heaviest of the snow, still had considerable work to do Monday. Gov. Dannel Malloy kept nonessential state employees home. “I understand that everyone wants to get back to normal as quickly as possible,” Malloy said Sunday. “Crews are working around the clock to accomplish that goal. But the last thing we need at this point is a typical morning rush-hour commute. Traffic build-up will only delay the effort to clear our roads." 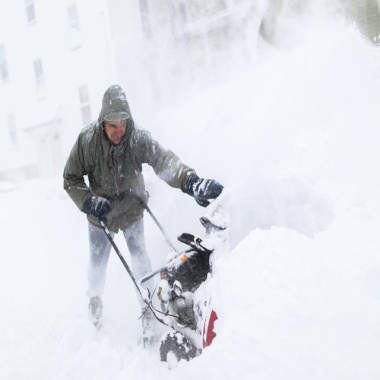 NBC's Ron Mott reports that cleanup is slowly underway from the Blizzard of 2013 is underway in the Northeast. Snow totals in parts of Connecticut were the storm’s worst. Hampden got 40 inches, Milford 38, and New Haven 34. Connecticut was among the five states that declared a state of emergency, the others being Massachusetts, Rhode Island, New York and Maine. Major cities appeared set to get back to business Monday, though. The Massachusetts Bay Transportation Authority said its services would resume, albeit with “significant delays expected” and buses running on snow routes. In New York, the Metropolitan Transit Authority said subways and local and express buses would operate as normal Monday morning. Extra trains were put on some major commuter lines to help get workers back to the city. As the Northeast shovels and plows, more could be on the way. Another winter storm heading into the Northern Plains and Upper Midwest could bring snow later Monday to parts of northern New England, particularly Maine, according to The Weather Channel. Safe for Northeast commuters to return to work?